Abraham Verghese, MD, is the keynote speaker for the American Association of Equine Practitioners’ 64th annual conference this December in San Francisco. 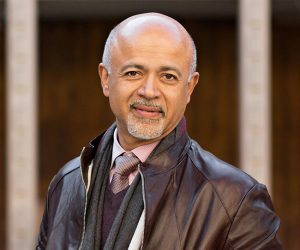 Abraham Verghese, MD, educator and best-selling author, will share his keynote lecture, “A Doctor’s Touch,” at the American Association of Equine Practitioners’ (AAEP) 2018 Convention in San Francisco. In his presentation, scheduled for Sunday, Dec. 2, Dr. Verghese will align equine medicine with human medicine and explain his vision of humanistic medicine—care-grounded medicine and the sanctity of the doctor-patient relationship. Verghese is the Linda R. Meier and Joan F. Lane Provostial Professor and Vice Chair for the Theory and Practice of Medicine at the Stanford University School of Medicine as well as a critically acclaimed author whose memoirs and novels have sold millions of copies, topped best-seller lists, and earned movie deals. To view the educational program and register for the AAEP’s 64th Annual Convention, visit convention.aaep.org. The AAEP keynote address is sponsored by Merck Animal Health.